The military have no constitutional authority or capacity to make arrests. This has been revealed in a video speech by 2019 presidential candidate and convener of the Cabal Must Go movement, Dr. Perry Brimah. “The military do not have handcuffs, they cannot press charges. They cannot make arrests, they can only apprehend as you and I can. When they “arrest,” that is intimidation of the populace and terrorism.” Dr Brimah explained in the 4 minute clip. 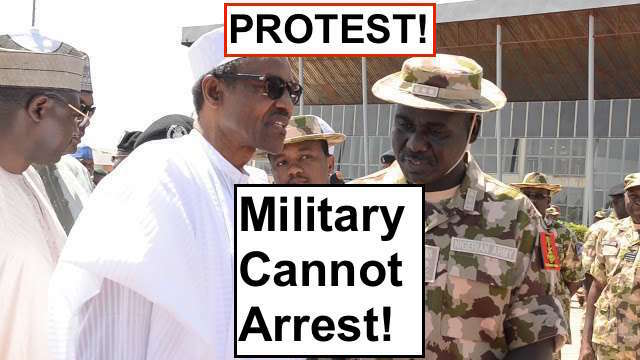 While chastising the media for supporting such false announcements by the military, Dr Brimah urged Nigerians to join global #ProtectMe protests commencing May 2nd demanding restoration of proper security and law enforcement in Nigeria; with the police redrafted from serving only the cabal to protect the 198 million masses and the military retired to the barracks.